Digital Painting tutorial archer bunny and Gryphon concept art. I am using Photoshop Cs5 and Wacom Tablet. Digital Painting tutorial archer bunny and gryphon concept art. This tutorial shows you how to paint a concept art of a fantastic archer bunny takes down the giant Gryphon. This image takes me about a little over 30 minutes to finish. You can scroll down further to see step by step images with instruction. A lot of concept art or illustration is all about telling story. In this one, I have an idea similar to David vs Goliath. It is a story of a little archer bunny guy who took on a Giant Gryphon and defeat him to protect his clan or his bunny family. I think if you look at the image, you should be able to get the story. In this tutorial I start with choosing my color palette and composition. Once I have some vague or rough idea, I can then start to explore with shape on my canvas. Then I tackles on the character design with the back/side lighting. At this stage, I only focus on big shapes and lighting to get the overall look and feel of the character. Once I get a rough idea on the bunny character. Then I start to add the fallen Gryphon behind him and go back to polish the main character, the bunny. Then the rest will take care of itself, I will just add the detail to the story as I go on painting. 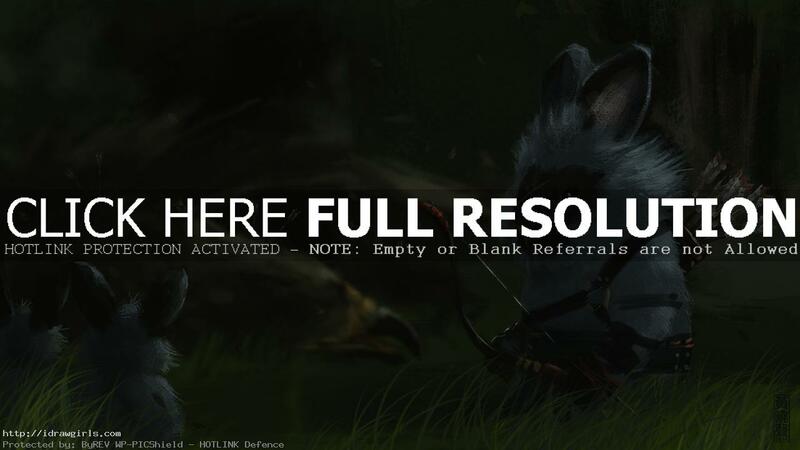 Below are step by step images how to paint archer bunny.